I LOVE, LOVE, LOVE these books by Laura Beers! She writes in such an engaging way. And she’s created a world that I never want to leave. I’m always a little sad when I’m finished reading one of these books. They are just so amazing! I was thrilled to get to learn more about Josette in this one. She was just such a mystery. Even through most of this book she kept her past hidden both from Morgan and from the reader. There were snippets where she might have told a secret or two, but nothing major. That made me want to not put this book down. Morgan is such a great character as well. I loved the way he seems to be one thing. But he’s a spy, so what he seemed to be was all just an act. He dealt with a lot of craziness from Josette and their pretend marriage. But I loved the way he just let it all roll off and went with it. His character is great! One of my favorite things about this one is that all of the characters I’ve loved from the other books play a role in the plot. It’s so much fun when the other men from the books threaten each new man about the ladies. Or when they show up to help each other. The plot of this one is so great! I had no idea what was coming. Who the bad guy was or how they were going to stop the plot. Make sure to read these ones. I would definitely start with Saving Shadow. You’re going to want all of the background information on all the characters. 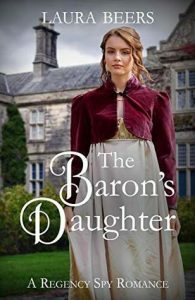 I was sent an e-copy of The Baron’s Daughter as a gift from the author. All opinions are my own.